Anyone that tries this peanut butter apple dip wants the recipe. It’s super easy using cream cheese, peanut butter, brown sugar and milk. In a mixing bowl using an electric mixer, combine the first 4 ingredients. Beat on medium-high until smooth and creamy. Serve with apples. Store in refrigerator. Hint: to keep your apple slices from browning, sprinkle them with lemon juice and toss to coat. 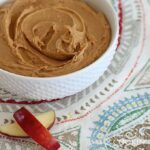 This recipe for Peanut Butter Apple Dip was printed from AmandasCookin.com - https://amandascookin.com/peanut-butter-apple-dip/ and can only be printed for education or personal use.